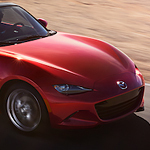 Soft Top- The Mazda MX-5 Miata comes with a convertible soft-top that can easily and conveniently be dropped while in the driver’s seat. This feature allows the driver to drop the top with one hand and just as easily raise the top in the event that the weather conditions are no longer suitable for having the top down. Lighter- The Mazda MX-5 Miata was specifically engineered to be lighter than previous models to allow for better handling especially around turns and corners. The newest version is 148 pounds lighter than previous models. Interested in checking out the Mazda MX-5 Miata for yourself then come visit Brunswick Auto Mart at any of our convenient locations and test drive one today.